Could this little doggie stamp be any cuter? 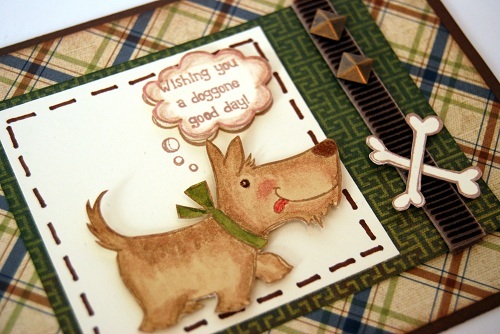 This A size set is just $6.95 and has the dog, the bone, two sentiments (there is also a Hello! sentiment) and the word bubble. Just the right price and size for oodles of cute cards. I lifted this one from the new Idea Book and just changed up the papers. I colored the puppy with watercolor pencils and used the Blending Pen to smooth out the colors. 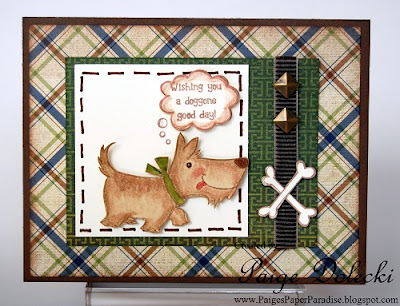 This is a great stamp set, and I LOVE your card!! I LOVE this card! I just got this stamp set a few days ago and can't wait to use it. Such an adorable card! Great job coloring...that's always the hardest part for me!